Greyhounds are a gentle, non-agressive breed. They very rarely bark, have minimal shedding and have no doggie odor. They require monthly toenail clipping and ear cleaning. They only need 3 to 4 baths a year. Ex-racing greyhounds are between 2 1/2 and 5 years old. Their life span is 12-15 years and you may select male or female. You may request a specific color but we cannot promise one will be available. We hope that matching your family and lifestyle with the right Greyhound is more important than color. 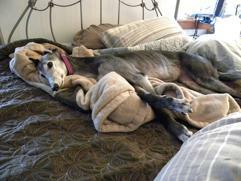 Greyhounds do not require a lot of exercise. They are usually happy sprinting around a FENCED yard. We do not accept electric fences. You can never allow a greyhound off-lead in an unfenced area. Why? Sighthounds see over 1/2 mile and have been bred and trained to chase small running objects. No obedience training will ever stop your greyhound once it starts running. They have no knowledge of traffic when in pursuit! They run over 40 miles an hour. It is inhumane to tie any animal on a tether, but can be deadly for a greyhound. Greyhounds are sprinters and can break their neck if they decide to bolt. Greyhounds live indoors. Why? They have very little body fat and have hair instead of fur. They cannot be put into a doghouse or a garage. They cannot withstand extreme heat or cold and are very susceptible to heat stroke. Are they jogging companions? Most are not. Greyhounds are not long distance runners and tire easily. Greyhounds must be gradually worked up to long walks or jogging, but NEVER IN HOT WEATHER. Hot pavement can damage the footpads. 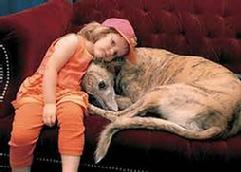 Placing a greyhound or any dog with a child requires education and dedication on the part of the parents. Children need to be taught to respect the dog's private area and leave it alone when eating, sleeping or resting. 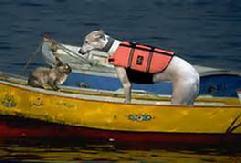 Greyhounds as a breed are gentle and non-agressive and are a companion dog not a rough and tumble playmate. They have no padding to protect themselves from rough children and toddlers falling on them. All children should be monitored when they are with any animal. The greyhound's lack of play may be frustrating to a child. They are gentle, but like all dogs they will respond when hurt. And as with all animals, parents must be responsible and monitor the children when they are with the dog. Greyhounds like quiet, gentle children and adults. 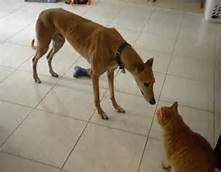 The greyhounds we place are cat tested. Even though they have been cat tested, a proper introduction is a must! This is a test for indoor cats only! Outside cats are fair game. Greyhounds in general are not barkers though some definitely do. If you live in an apartment, please think carefully about the consequences if your greyhound barks while you are not home. Will this cause problems? Will you be asked to make a choice to either move or give up your dog? An in-depth conversation with the adoption representative will be part of the application process and further discussion can be had at that time. Greyhounds are kennel broken. They learn to keep their kennel clean and to relieve themselves out doors. Housebreaking is usually quick. During the aclimation period with your greyhound it is important to allow him/her to relieve themselves several times throughout the day . If you are consistently out of the home for periods longer than 8 hours with no options for letting your greyhound out to relieve themselves, your application may not be approved. 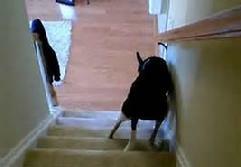 Greyhounds have never seen stairs. With time and help from you they will soon learn. I am not sure I like this! Love is never having to say "get out of my bed"! Most greyhounds have not seen children . With time they will fall in love with them. 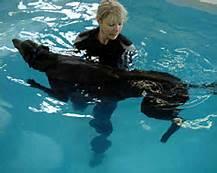 Greyhounds have never been in the water. Life jackets are a must! I have a long tail. Watch doors! I can run fast, but only in a fenced area!